Within the course of one incredible year in the pages of Marvel Comics’ Fantastic Four, the writer/artist duo Stan Lee and Jack Kirby created characters like the Inhumans, the Silver Surfer, Galactus, and the Black Panther—comics’ first black superhero. To have debuted him in 1966 (in Fantastic Four #52) shows both bravery and prescience on Marvel’s part; to their credit, the Black Panther would go on to take a central role in their comics for years to come. The Panther was T’Challa, chief of the hidden African country of Wakanda (traditionally, in comics,, African countries are always hidden). Wakanda was depicted as a peculiar mix of high-tech machinery and mud huts, its futuristic technology being derived from “vibranium”, a metal found in a meteorite. The Black Panthers had been developed as a succession of elite guards, each in turn protecting the meteorite with the aid of sacred herbs which granted them fantastic strength and agility. T’Challa was the current inheritor of the Black Panther mantle (and all-black costume). After meeting the Fantastic Four, T’Challa decides his powers would be put to best use protecting the whole world (or at least America), and so he flies off to New York, leaving his people, and his rather impractical cape, behind. For the next couple of years, the character flitted about from comic to comic before joining the Avengers in 1968, where he became a mainstay for the next seven years, save for the occasional jaunt back to Africa for the odd chunk of vibranium (which handily seemed to defeat most criminals). Marvel rarely made much of the Panther’s color in the 1960s, but in the more radical 1970s he acquired a forthright, liberated girlfriend, Monica Lynne, and briefly became a teacher in the ghetto, while the Avengers took on the racist Sons of the Serpent. Although it seems to have been pure coincidence, Marvel could not help but note that one of their leading characters shared his name with the radical black-power movement the Black Panthers, and briefly changed his name to the Black Leopard. One month later, however, he was back to being the Black Panther again, and in 1973 was finally granted his own strip. “Panther’s Rage” ran for two years in the wonderfully titled Jungle Action, series written by Don McGregor and drawn for the most part by the African American artist Billy Graham. Reflecting the times’ interest in African roots and black consciousness in general, the strip returned T’Challa to a Wakanda riven by infighting and sedition, where he managed to balance superheroics with musings on colonialism and democracy. The more overtly political material was leavened by the Panther’s romance with Monica, which was surprisingly passionate for the time. For the duration of the tale, the strip featured an all-black cast, something that had never been attempted in comics before, and the innovations continued in a later story, which saw the Panther take on the Ku Klux Klan in Monica’s native Georgia. 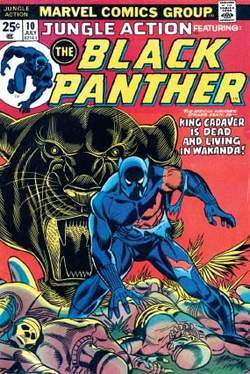 Poor sales prompted Marvel to cancel Jungle Action before the Klan story was finished, and replace it with a new Black Panther title by his creator, Jack Kirby. This new direction was as far from the gritty realism of McGregor’s tales as it is possible to imagine, as the hero encountered the likes of King Solomon’s Frog, the Yeti, and the Black Musketeers. Not surprisingly, this title, too, was short-lived. Sporadic appearances over the next two decades kept the Panther in the Marvel firmament, but he was increasingly marginalized. Miniseries in 1988 and 1991 were solid, if unspectacular, attempts at revitalizing what was effectively a lapsed franchise. The first tackled apartheid while the second dealt with the Panther’s search for his mother, but neither led to anything substantial. With black characters no longer a comics novelty, and with role models such as the characters of Milestone Comics— which had more relevance to their readers than a wealthy African king—it seemed as if the Panther’s time had passed. However, in 1998, out of the blue, writer Christopher Priest reintroduced the hero as part of the slightly more adult “Marvel Knights” line, in a series that was acclaimed in every venue from the fan press to Entertainment Weekly, and continued for six years—by far the character’s most successful run. For this reinvention, a now aging T’Challa returns to the urban jungle of New York armed with claws and the occasional gun, and after thirty years he once again sports a cape. In a series of hard-hitting tales, he abdicates, witnesses his daughter’s murder, and then temporarily passes on the mantle of the Panther to a young cop, Kasper Cole. uk) SULTRY Kaliko black leopard jacquard jacket, pounds 109 (www. I don't know anyone else that brings a black leopard out on the stage with all its teeth and claws. He thought the idea of hundreds of black panthers - technically all black leopards - roaming the UK was ridiculous. In the Malayan jungle, on the same day, I saw a giant python and a black leopard. While there was no photographic proof to go with the sightings, one of the most impressive breakthroughs saw a large Experts determined the print was most likely that of an 18-month-old exotic large cat, possibly a black leopard, which was the offspring of an animal that was privately owned, released the decade before. At Bandipur, a black leopard was photo- captured on April 24, 2008, and another photo capture was recorded on February 7, 2010. 99 Internacionale Ring box pounds 28 Next Black leopard print stilettos pounds 25. 30pm) Du Plessis rallies the troops to prevent Danny from losing his career when the vet blamed for the death of a rare black leopard. The collection featured baby blue soft felt dresses, flower print silk tops in pale pink and yellow, green and black leopard print fabric, baggy trousers with drawstring waists. Susan was last seen wearing blue jeans, a striped blue and black top, a cardigan with a black leopard print across it, a three-quarter length black coat and black shoes. A ZOO manager has broken a 15-year silence to admit that he has seen a black leopard roaming in Tamworth. I greatly enjoyed Christopher Ondaatje's article on the black leopard (The riddle of Lewa Downs, November 2005).